One of my favorite Christmas gifts was four beautiful pomegranates. 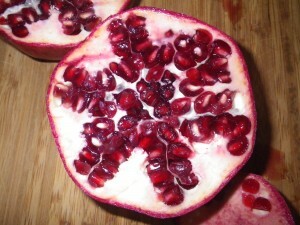 Pomegranates are one of those foods that I don’t often consider buying for myself. They are a real treat. One of the reasons I usually shy away from buying them is that pomegranates can be tricky to peel and separate the juicy aril from the surrounding membrane. This is a slow process that usually results in stained fingers and spots of pomegranate juice on my clothes. Never heard of the word “aril” before? It means a fleshy appendage covering seeds—or seed sacs. Each pomegranate contains about of 600-800 of these arils or about ¾ cup fruit. The crunchy seeds and this surrounding juicy pulpy sac are the choice edible parts. Knowing I like kitchen gadgets, my friend also gave me a pomegranate deseeder (www.seedout.com) and it does make getting the arils or seeds easier. There are several different types available in fancy food markets and most cost under $5. If you don’t have a deseeder, there are several ways you can get the seeds out. It’s usually recommended to peel them underwater in a bowl. The heavy seeds sink to the bottom of the bowl and the pity membrane floats. You just remove the white membrane and strain the water off the arils. I have to admit, the results are worth the work. Yum. Nutritionally pomegranates are considered a “super food” because they are a concentrated source of antioxidants and phytochemicals. Just 1/2 a medium pomegranate gives you 130 calories, 6 grams of fiber and 25% of your daily Vitamin C needs. They also have some B vitamins and potassium. This is a time of year to buy fresh pomegranates. They are in season September through February. What can you do with pomegranates? Once you’ve tried them, the ideas are endless. 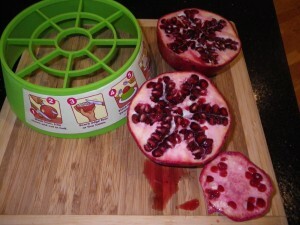 Introduce your kids to pomegranates, too. They might enjoy the adventure of seeding and tasting this unique fruit. Kids tend to like new things when they can help prepare them. 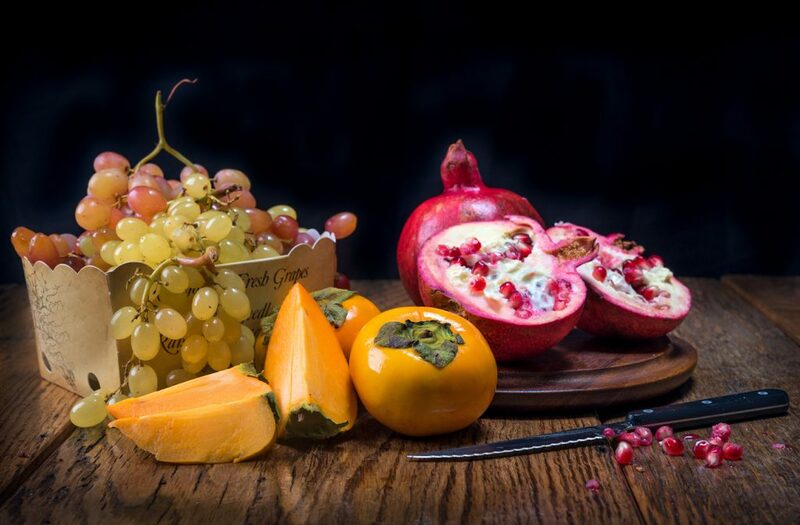 Here is a beautiful arrangement of winter fruits with pomegranate, persimmon, and grapes.